How much do Trail Blazers suites cost? Moda Center luxury suites will vary in price based on event. For Portland Trail Blazers games, private suites can range from $3,000-$10,000 depending on opponent, day of the week, and suite size/location. Suite pricing for concerts and other secondary events will vary widely; some acts start as low as $1,500 while others can go up to $20,000. Executive Suites at the Moda Center come 22 tickets and 4 VIP parking passes. Portland Trail Blazers suite amenities include interior lounge seating and exterior seating on the suite balcony. 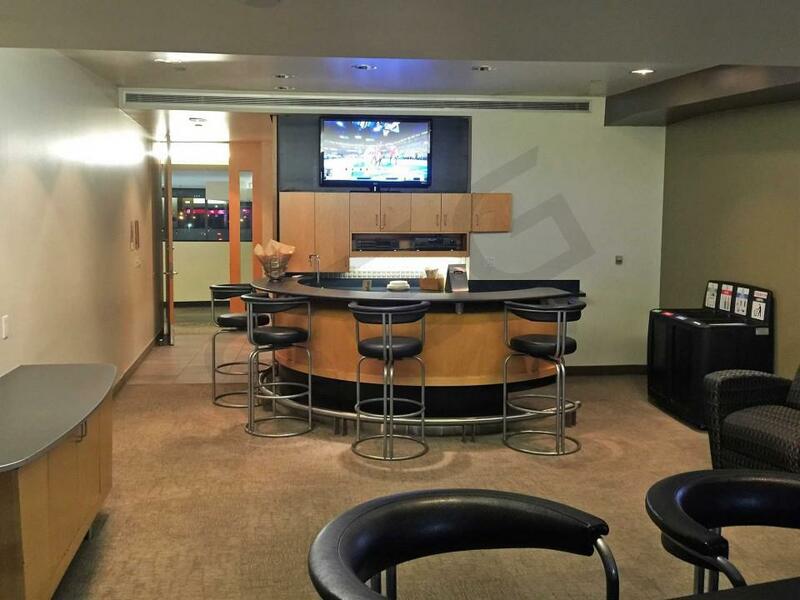 Moda Center suites will feature HDTV's, bar/kitchen area, private restroom, and a shared suite attendant. In-suite catering is available at an additional cost. With a suite ticket, guests can also use a private entry into the Moda Center. Suites will open 2 hours prior to tip-off. Studio Suites are a great option for groups of 4 or less seeking a more intimate experience. Each Studio Suite comes with a private dining table and access to free food and beverages including high end beer and wine. These suites also come with 2 VIP parking passes and access to an exclusive stadium club. In this section we’ve compiled key considerations when planning your next group event in a luxury suite at the Moda Center in Portland, Oregon. There are several sizes and configurations of suites and private group spaces at the Moda Center. Most private suites on the main suite level will accommodate groups of 18-25 people. A select few suites can accommodate larger groups of 80-100. Studio Suites, occupying one section of suite level, offer a semi-private space for smaller groups of 4-6. Moda Center premium seating options range widely in price. For Portland Trail Blazers games, private suites will typically cost between $6,000-$12,000 depending on opponent, day of the week, and suite type and location. 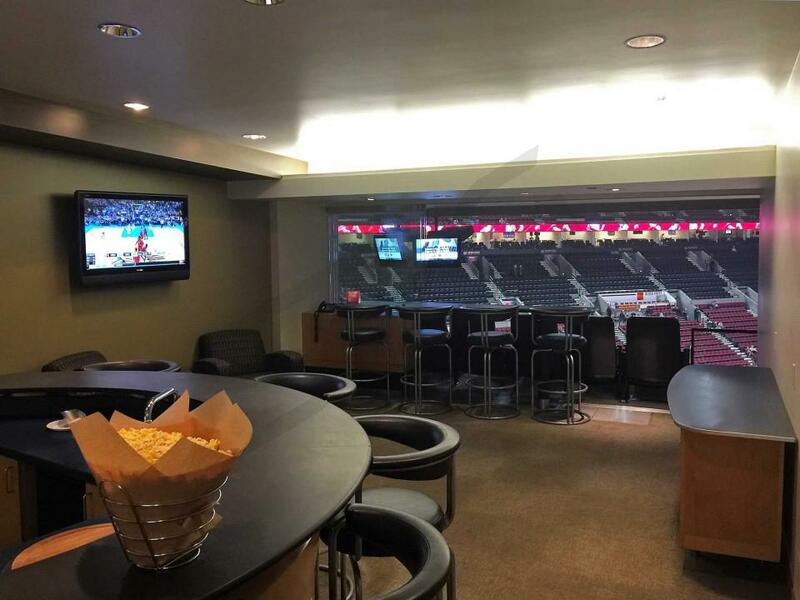 Suite rentals for Portland Winterhawks (WHL) major-junior hockey games will cost between $1,000-$2,000. Suite prices for non-basketball events will vary; suite for some concerts and family events can be priced as low as $2,000 while popular performers will command suite prices of $12,000+. In-suite catering is available for all private suites at the Moda Center. The menu includes a wide range of food and beverage options provided by Levy Restaurants. Private suites at Moda Center will not include catering in the base price of the suite, so be sure to allocate additional funds to cater your suite. Studio Suites will, however, come inclusive of food and beverage. Most Suite Experience Group clients at the Moda Center will spend between $1,000 and $2,000 for their group; however, there is no catering minimum. Moda Center suite ticketholders have access cuisine stations and cash bars located on the Kuni Lexus Club Level. No backpacks of any kind and no bags larger than 14”x14”x6” are permitted into the Moda Center. Children under the age of 2 will not require a suite ticket to enter the arena. The Executive Suite Level Entrance to the Moda Center is located to the left of the main entrance. Guests can also enter through the Lexus Club doors to bypass lines. VIP guests parking in the Garden Garage attached to the stadium will have a direct VIP entrance to suite level. VIP parking is located in the Garden Garage which is physically attached to the arena. All Rose Quarter parking garages open 2 hours prior to tipoff. The Portland Trail Blazers return much of the same team as last season, a year in which the Blazers won 49 games and earned the #3 seed in the loaded Western Conference. Portland will look to build off their dynamic backcourt of Damian Lillard and C.J. McCollum. Center Jusuf Nurkic will also return after signing a 4 year, $48 million contract in the summer. Lillard and McCollum bring a contagious energy to Moda Center each night. The offense runs almost entirely through their guards, with forwards Mo Harkless, Evan Turner, and Al Farouq-Aminu serving as essential role players. Lillard has improved each year of his career, which suggests a run at the MVP shouldn’t be out of the question in 2018-19. Last season he averaged 27 points and just under 7 assists, while McCollum dropped 21 each night. In the frontcourt Jusuf Nurkic and Zach Collins plan to share time at center. Nurkic has been a huge weapon for the Blazers on offense, developing great chemistry with Lillard on the pick and roll. His scoring ability around the rim helps diversify the Blazers offensive attack when Lillard and McCollum’s shots aren’t falling. Zach Collins will look to take a step forward after his rookie season last year. The Western Conference will be even tougher in 2018-19, and the Blazers expect to be right in the thick of the playoff race once again. Last year’s first round playoff series against the Pelicans did not go as expected, which will only motivate Portland to get back to the playoffs and make a deep run. Led by head coach Terry Stotts, the Blazers have high expectations in 2018-19. The Blazers have one of the best home court advantages in the NBA, especially when premier opponents come to town. A Portland Trail Blazers’ luxury box can hold up to 22 people. Guests will receive the finest amenities including VIP parking, HDTVs, upscale furnishing, comfortable seating and premium in-suite catering options. Whether you are entertaining for business or for pleasure, a Trail Blazers suite provides the perfect setting for any occasion. Experience the suite life at a Portland Trail Blazers game. Executive suites at the Moda Center will offer a VIP experience for groups featuring premium in-suite catering options and an intimate setting for corporate or personal entertaining. A Blazers suite will include 22 tickets and 4 VIP parking passes. Guests with a Moda Center suite ticket will get to enter the arena through a private entrance and have exclusive access to the suite level. From a luxury box, fans can watch the likes of Damian Lillard, CJ McCollum and Jusuf Nurkic from theater-style seating on their suite balcony. Not to mention, catch all the replays on multiple HTDVs in the suite. The Western Conference is filled with great teams and the Blazers know to be one of the best, they’ll need help outside of their top 3 stars. Evan Turner, Ed Davis, Maurice Harkless, Al-Farouq Aminu and Meyers Leonard are the role players the Blazers need to find consistency in. Lillard is one of the best point guards in the NBA and can carry this team into the playoffs himself. McCollum paired with Lillard forms one of the best scoring duos in the league. Head coach Terry Stotts has been a master at getting the most out of his players. Speaking of which, the Blazers are hopeful that rookie Zach Collins will catch up the speed of the NBA and be a force down the stretch. Outside of the Blazers, you can rent a luxury suite for any concert or event coming to the Moda Center. Some of the big events coming the Moda Center in 2018 include Katy Perry, Disney Live!, TobyMac, Monster Jam, Lorde, Jeff Dunham, Trevor Noah, Pink, Sam Smith, Foo Fighters and Cirque Du Soleil. In the 2015-16 season, the Portland Trailblazers ousted Western Conference power, the Los Angeles Clippers, in the first round of playoffs in six games. Unfortunately, the lost to the eventual Western Conference champs the Golden State Warriors in the second round. Despite their inability to get deep into the playoffs, there is a ton of optimism in Portland right now because of the depth and talent of this Blazers squad. Guards Damian Lillard and CJ McCollum lead the attack for the Blazers with elite shooting and sneakily creative work in the pick and roll. Lillard has been an all-star for the last two seasons and there is a good possibility that his backcourt mate, CJ McCollum, will join him as an All-Star this year as well. Portland signed McCollum to a four year and $106 million dollar extension in the offseason, so they are expecting him to continue to improve upon his career high averages of 20.8 points per game, 4.3 assists per game and 3.2 rebounds per game. To compliment their high-scoring guards the Blazers have the incredibly athletic Mason Plumlee at center. The former Duke center had the best year of his career in 2015 finishing with career-high averages of 9.1 points per game, 7.7 rebounds per game, 1.0 block per game and 2.8 assists per game. Off the bench, the Blazers employ multi-talented wings, Allen Crabbe and Maurice Harkless. Crabbe is an elite marksman who is skilled at creating off the dribble while Harkless uses his length and jumping ability to finish around the rim and play tenacious defense. In the offseason, the Blazers signed wing Evan Turner and center Festus Ezeli. Turner was the far more expensive option costing the Blazers four years and $70 million to sign while Festus Ezeli commanded only two years and $16 million. Both will be integral parts of the Blazers bench, which is filled out with players like Meyers Leonard, Jake Layman, Ed Davis and Shabazz Napier. If the Blazers continue to improve they should have the firepower to take down any team in the League. You can watch the new-look Trail Blazers fight their way back into the Western Conference playoffs from a private luxury suite at the Moda Center, formerly the Rose Garden. 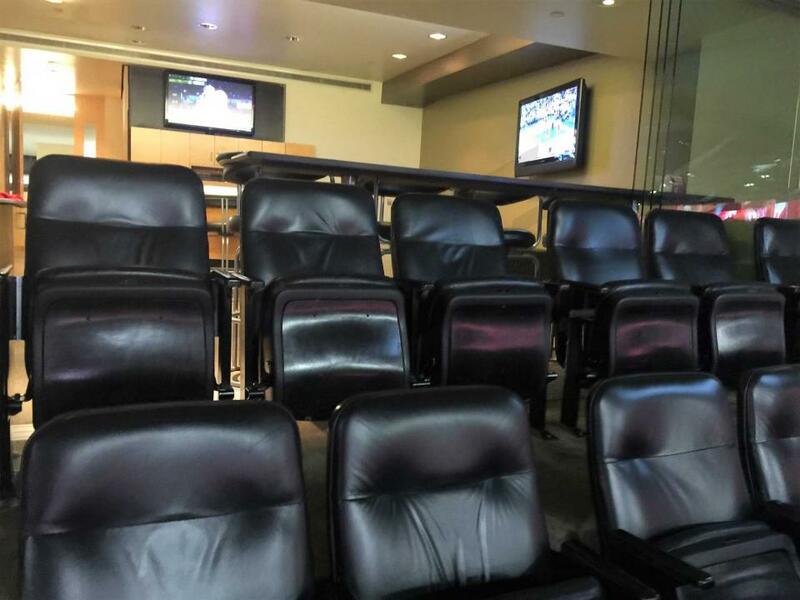 A Portland Trail Blazers’ luxury box can hold up to 22 people. Guests will receive the finest amenities including VIP parking, HDTVs, upscale furnishing, comfortable seating and premium in-suite catering options. Whether you are entertaining for business or for pleasure, a Trail Blazers suite provides the perfect setting for any occasion. The Moda Center will also host a Maroon 5 concert and the Amy Schumer Tour. The Portland Trail Blazers finished with the fifth seed in a very tough Western Conference last year. There’s no reason to think they can’t get back into the playoff hunt in 2014-15. Led by their all-stars LeMarcus Aldridge and Damian Lillard, the Trail Blazers are one of the NBA’s top scoring teams. Add in the supporting cast of Welsey Matthews, Nicolas Batum and Robin Lopez the Trail Blazers have one of the better starting lineups in the West. You can watch the Trail Blazers light up the scoreboard from a private luxury suite at the Moda Center, formerly the Rose Garden. A Portland Trail Blazer luxury box can hold up to 22 people. Guests will receive the finest amenities including VIP parking, HDTVs, upscale furnishing, comfortable seating and premium in-suite catering options. The Portland Trail Blazers are one of the biggest surprises in the NBA this year. After a disappointing season in 2013, the Trail Blazers have turned things around and are in the hunt the NBA Championship. They’ve been one of the Western Conference’s elite contenders all season. Led by their all-stars LeMarcus Aldridge and Damian Lillard, the Trail Blazers are one of the NBA’s top scoring teams. You can watch the Trail Blazers light up the scoreboard from a private luxury suite at the Moda Center. Luxury boxes can hold up to 22 people. Guests will receive the finest amenities including VIP parking and in-suite catering options. Thank you for signing up for specials at Moda Center. Enter your email address below to stay in touch. We'll sign you up for our newsletter, which will inform you of the latest inventory and events at Moda Center. We promise we will never sell or distribute your information. 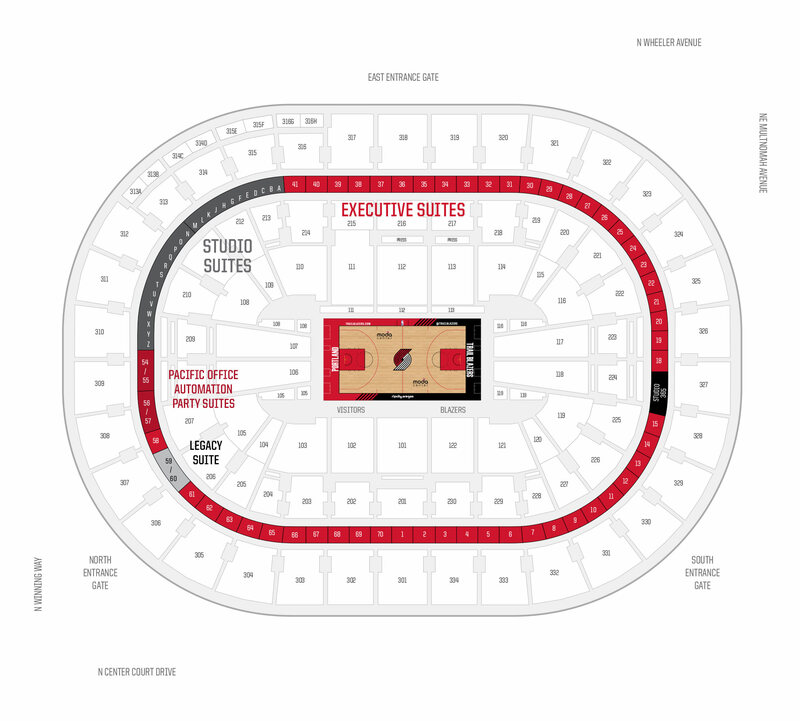 The seating chart below shows where the Portland Trail Blazers suites at Moda Center are located.